MY BROTHER rings. Out of the blue. From interstate, where he’s lived more than half his life. “Well, you’d written your name on the two albums, inside the front cover.” A chuckle comes down the line. I cannot recall wishing, pondering, dreaming about stamps. I cannot recall the anticipation, the satisfaction, the excitement of collecting them. I am holding the phone to my ear and trying to make sense of this new-found (so to speak) hobby. I’m stumped. Stamps? We say goodbye. I was a stamp collector? And my brother? Nearly 50 years ago? It’s not everyday your brother rings. And tells you about a part of your past you’d forgotten. THESE DAYS there is next to no anticipation in walking to the letter-box to see if the mail has arrived. There’s not much in there but bills, bills, and more bills. Maybe a birthday card from an elderly aunt. A Christmas card from interstate. Rarely a letter, a hand-written letter. Australia Post recently wrote to me (well, to myself and millions of other householders) about changes to its services. ‘Australians are becoming less reliant on letters as a form of communication…’ No surprises there. ‘Business and government now account for 97% of all letters sent in Australia.’ No wonder the walk to the letter-box is more chore than treat. The letter from Australia Post is a softener about changes to its services. It talks about being able to ‘Activate your free MyPost Digital Mailbox’. It talks about ‘a new non-urgent “Regular” service that will take two days longer to deliver than the current delivery timetable for letters’. And the price of stamps will increase. Not ideal, I think. Not exactly an improvement, an upgrade in services. But I can wait two days longer for my letters to arrive. My friends can wait. Two or three times a year I write letters to Paul, to Brian, to Gina, to Clare, to Stephen. They don’t live far away. Paul is five minutes by pushbike. Stephen another ten minutes of pedalling. Brian, Gina and Clare about half-an-hour by car, depending on the traffic in their suburbs. They’ll be okay waiting another day or two. 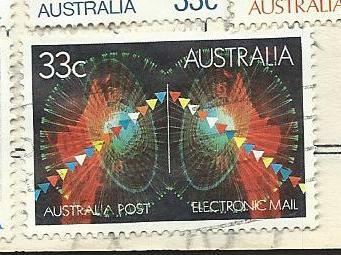 Time for the stamp (a pretty picture of a kookaburra, or a kangaroo or a koala) to stick to the envelope. Time for the ink to dry on the paper, for the hand-written words to settle on the pages. Time for the stories and anecdotes and questions and wonderings and greetings and goodbyes to nestle inside before being set free. MY BROTHER posts the two stamp albums. In An Australia Post ‘Padded Bag Extra Strength Postpak’. There is no stamp with a pretty picture, but a receipt affixed to the top right-hand corner telling me it has cost my brother $3.50 to post the 0.384kg parcel. The parcel fills up the letter-box, spilling the bills onto the ground. And on the inside back cover of one album is my tallying: ‘17 of July 104. 105 31/8/68 – 156 27.12.68 – 253 3/1/70 – 304’ . But the hand-writing is inconsistent and I wonder if my brother had taken over the tallying after I’d moved on to life-long hobbies like backyard cricket, kick-to-kick, and going to the beach. As for the stamps in the two albums, they are nothing to get excited about, as far as I can tell. There are 330 stamps in one album, and 90 in the other. Most are from Australia. Pictures of The Queen, and native flora and fauna. Flowers, birds, marsupials. The stamps that first catch my eye, all these years on, are those of fish: coral fish, humbug fish, anemone fish. I am a snorkeller and have seen some of these over summer. 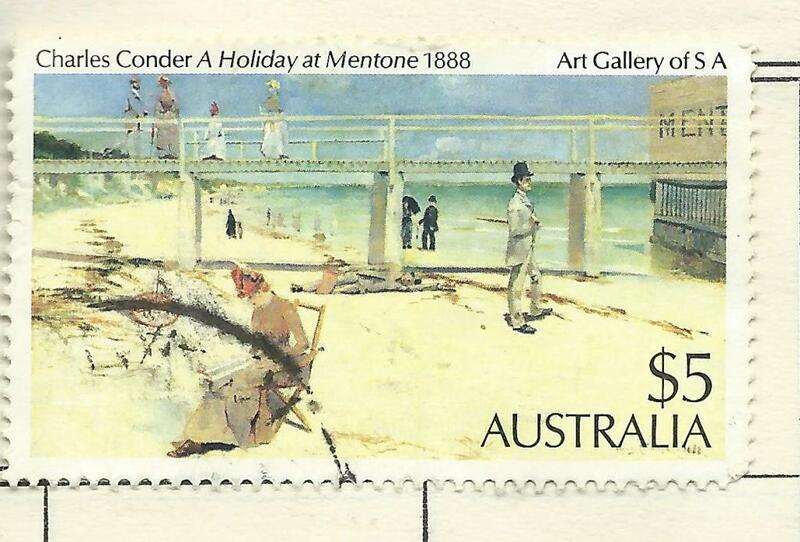 He recommends a particular Australian stamp, of the 1888 Charles Conder beach painting A Holiday At Mentone; painted some 80 years before my brother and I and our siblings lived in Mentone, the beach only a few minutes from Cremona St.
On the same page as the $5 Charles Conder stamp is the last Australian stamp to be stuck into the second of these humble collections. It is a 33 cent stamp placed there by my brother in the 1980s. It is not a stamp of The Queen. It is not of a bird or a fish or a flower or a marsupial. Nor is it a picture of the past, a commemorative stamp. It is rather more prescient. VIA E-MAIL I learn from my brother that he collected stamps throughout his childhood and into the early 1990s, into his mid-30s. 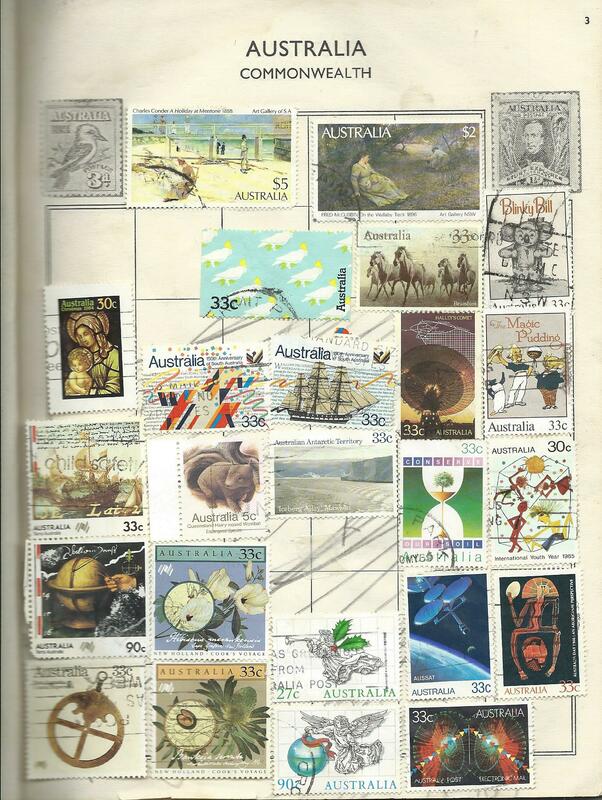 He bought collectors’ stamps on trips to Fiji, Singapore, Thailand and Cambodia. 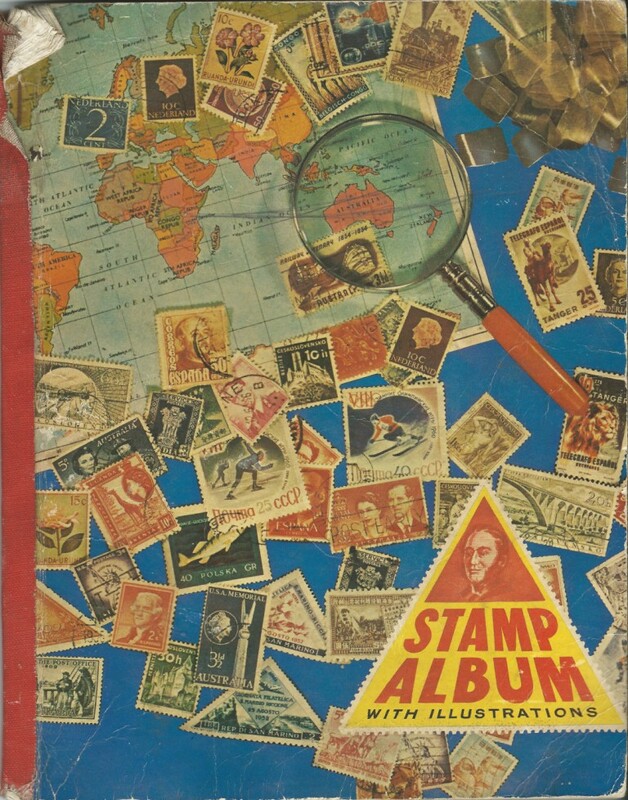 ‘In the early 90s a friend of a Cuban friend gave me a very special gift – a Cuban stamp book post revolution, with about one fifth all stamps inside.’ My brother’s stamp albums have travelled Australia with him: Mentone, Geelong, Alice Springs, Cairns, Sydney. It’s not every day your brother emails and tells you about a part of his past you’d never known. THE LAST Australian stamp in the stamp albums that I never thought I had is not of a kookaburra or The Queen or a historical moment. It is abstract. It is futuristic. It was probably very mysterious back in the 1980s. It suggests global communication. Fast, global communication. It suggests change. It is a stamp that suggests the demise of stamps and letters, especially hand-written letters. It says, on the bottom right hand corner, ‘ELECTRONIC MAIL’. I too have a stamp collection (and a matchbox cover collection for that matter) and i can sort of understand why it could have slipped the memory. However there was always one stamp i valued. It was a commemorative 1929 WA stamp i removed from a letter to my grandmother. Many years later my nine year old son was flicking through the book and accidentally tore it. I paused for a few moments before saying ‘that’s alright, it’s just a stamp’. *I have no talent at either.